Ma Su can draw one card and chose two people. These people each draw an extra during their next turn. Starting with Ma Su, ever player must pass a hand card to the person one distance to the right. If the target is two or more away, the card cannot be given and that player loses one health. For every damage Ma Su receives, he can choose another player. Both Ma Su and the target are out of the game until his next turn where they draw an additional card. 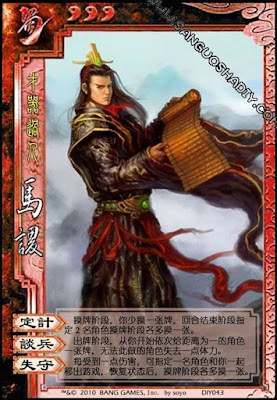 Ma Su can choose himself with "Scheming", but will not draw the card until his next turn.